Observation - The Last Stand - UK and Ireland. Description: I found these two engrossed in a fight to death and thought it made an amazing picture. I think its a (Dysdera crocata aka the spider) and a greenbottle (Lucilia Caesar). Would love feedback. I found these two engrossed in a fight to death and thought it made an amazing picture. 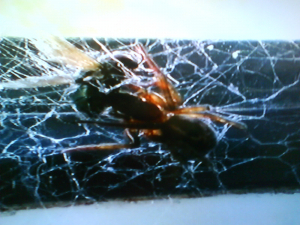 I think its a (Dysdera crocata aka the spider) and a greenbottle (Lucilia Caesar). Would love feedback.